When it comes to constructing your site’s pages and SEO, there’s a hot topic you need to know about: engagement objects. Engagement objects are non-text elements such as images, videos, audio, or interactive elements on a web page that help engage users. Not only do they make your page more interesting to a user, but they are also now becoming increasingly important as a search engine ranking factor. With the rise of blended search (also known as Universal Search in Google), search engine results pages (SERPs) are now able to show a combination of different types of files to a searcher. 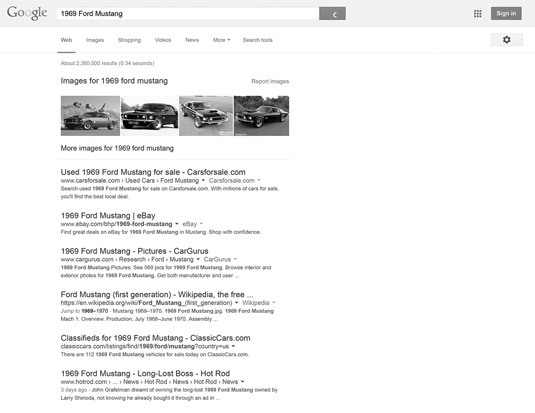 So a search for [1969 Ford Mustang] can return photos, videos, and so on, in addition to website links, all on the same SERP. Blended search results combine many different types of listings. The search engines (particularly Google) want to provide the most relevant and engaging results to their users, so having Engagement Objects on your website can actually make you rank higher in search results than your competitors. Images: Notice the number of photos, infographics, illustrations, diagrams, charts, and so on. Also pay attention to size. Larger images with good Alt attribute text and good surrounding text can get indexed and actually returned as a search result themselves, so notice whether the competitor has anything like this. Video: Video is extremely important these days for getting noticed on the web. The best method is to embed the video right into your landing page and also upload it or a portion of it to a video-sharing site like YouTube. Include a keyword-rich description and a link back to your site, and you’ll probably get traffic as a result. Consider this: YouTube’s internal search function now gets more total searches than Yahoo or Bing. Depending on how you look at it, that means YouTube is the second most visited search engine in its own right. Obviously, YouTube’s site search isn’t a true search engine, but you better believe that the traffic is true traffic. If your competitors haven’t been savvy enough to upload videos to YouTube and embed videos on their sites yet, here’s a good way to one-up them. Being where people can find you is critical. Audio: Look for embedded audio files within the site, which is another type of element that’s good for user engagement. Audio files are expected on music-industry sites, but other sites might benefit from a creative use of audio, as well. Google can now parse soundtracks and generate text of the words that can be subsequently indexed. This clearly shows that audio is a valid content form. Flash: Flash files (SWF) are not recommended, from an SEO point of view. A site built completely in Flash, in particular, can’t be very competitive in searches because it lacks sufficient text content and may be slow to load. There are many other types of engagement objects, and there is a lot more to say about the best ways to include them on your web pages.